Recent advances in interactive design technologies are changing the way we interact with the world around us—influencing our perception, social awareness and methods of communicating. These technologies are also revising the notion we have of our own bodies by augmenting, enhancing and expanding their functionality. Clothing is one of the most significant interfaces between our body and the environment. It defines so much of who we are. What if our outfits could recognize and respond to the gaze of others? 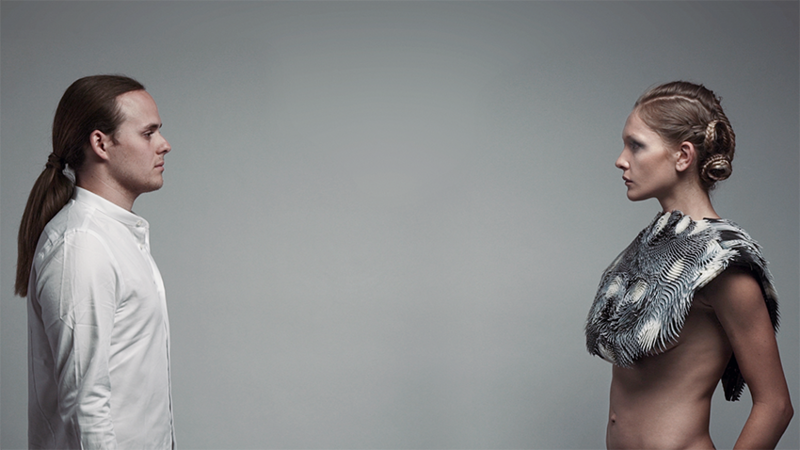 Caress of the Gaze is an interactive 3D printed garment—a kind of body architecture1 —which can detect other people’s gaze and respond accordingly with life-like behavior. This project offers a vision of the future by exploring the possibility of a second skin—fabricated using multi-material 3D printing—that enables the wearer to experience the most subtle aspect of social interaction: the gaze. Caress of the Gaze, Photo courtesy of Charlie Nordstrom and Elena Kulikova. The design research project was inspired by the involuntary action of animal/human skin, but also by its complex architecture—the interplay of muscles, hair, feathers, quills and scales. Natural biological skin is constantly in motion. It expands, contracts and changes its shape based on various internal and external stimuli, including not only temperature and moisture, but also feelings like fear, excitement and anger. Caress the Gaze explores how garments could behave as an artificial skin capable of changing shape and redefining social issues such as intimacy, gender and even personal identity. 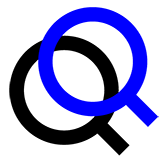 The project engages with a series of issues. First, it experiments with the very latest and most advanced 3D printing technologies to demonstrate how these tools might contribute to the realm of fashion. It explores the tectonic properties of materials used with Objet Connex500 3D Printers: a technology that not only allows for the fabrication of composite materials with varying flexibilities and densities, but also the combination of materials with different material properties deposited in a single print run. Removing the print from the Objet 3D Printers. Image courtesy of Behnaz Farahi. Inspired by the flexible behavior and morphology of skin itself, the outfit exhibits different behaviors in various parts of the body ranging from stiff to soft. Therefore, the initial investigation was to develop a system capable of gently moving, contracting and expanding based on its material properties. 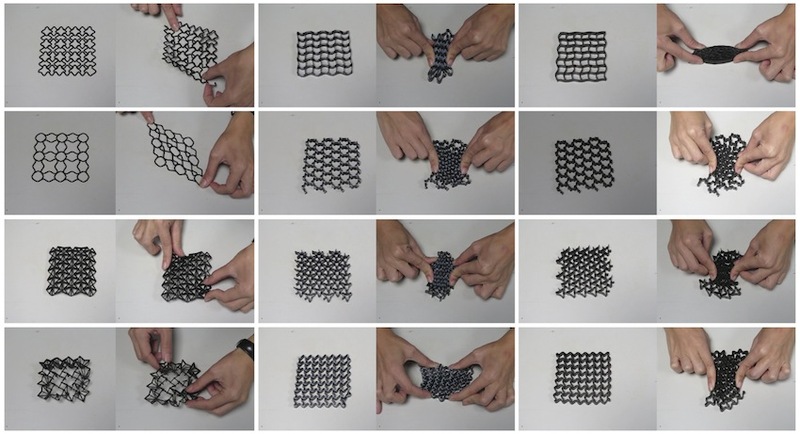 This process was highly iterative and hands-on, printed samples were continuously tested and catalogued. 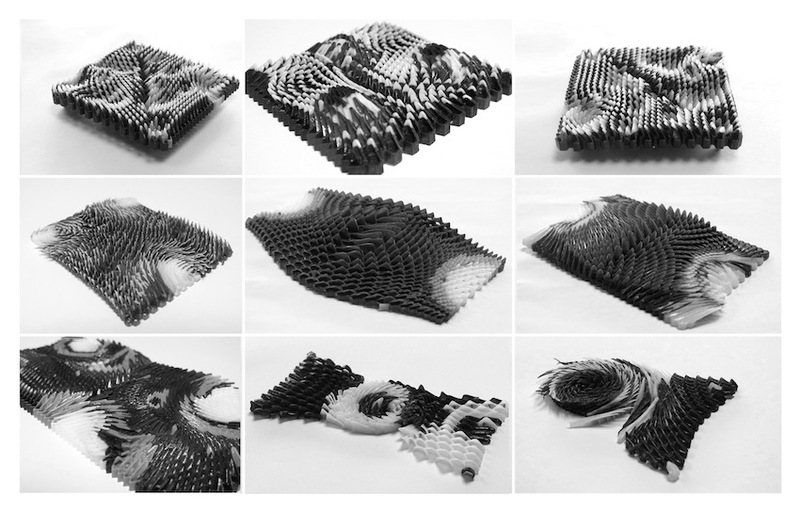 Study of Auxetic behavior of 3D Printed prototypes with cellular structures. Image courtesy of Behnaz Farahi. Various topologies of geometrical and material combinations were tested to enhance the aesthetic expression of the form as well as control the types of motion it could afford. Various topologies and taxonomy of geometries and material combinations. Image courtesy of Behnaz Farahi. Second, Caress of the Gaze explores the potential of an actuation system—assembled as a form of muscle system using Shape Memory Alloy actuators (SMA)—to inform the motion of the 3D Printed garment. While SMAs change their shape when heated to an activation temperature, they subsequently return to their initial state. In other words, SMAs can be deformed, but “remember” their original shape when triggered by a specific temperature. Third, the project investigates how our clothing could interact with other people as a primary interface using computer vision technologies. 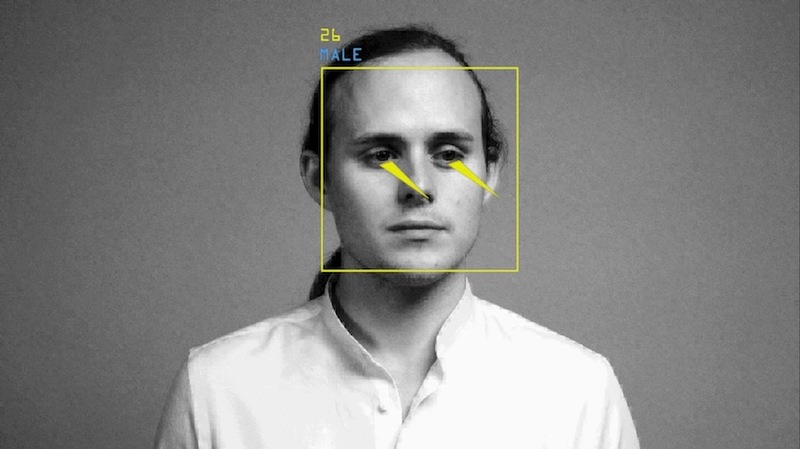 For this purpose, an image sensing camera, capable of detecting gender, age and orientation of the gaze, is used to communicate with a microcontroller that actuates and controls various nodes in the garment. This was achieved by mapping the yaw and pitch value of the onlooker’s eyes, allowing the garment to move in response to the onlookers’ gaze. Equipped with a facial tracking camera, the garment detects age, gender and gaze orientation of the onlookers. Image courtesy of Behnaz Farahi. As an interactive and autonomous system, the wearable garment becomes an extension of the wearer’s skin; responding to external stimuli similar to that of goose bumps on our skin. Like a porcupine that feels threatened and bristles its quills, the wearable allows the wearer to “feel” the otherwise invisible aspect of our social interaction—translating the onlookers’ gaze into motion. 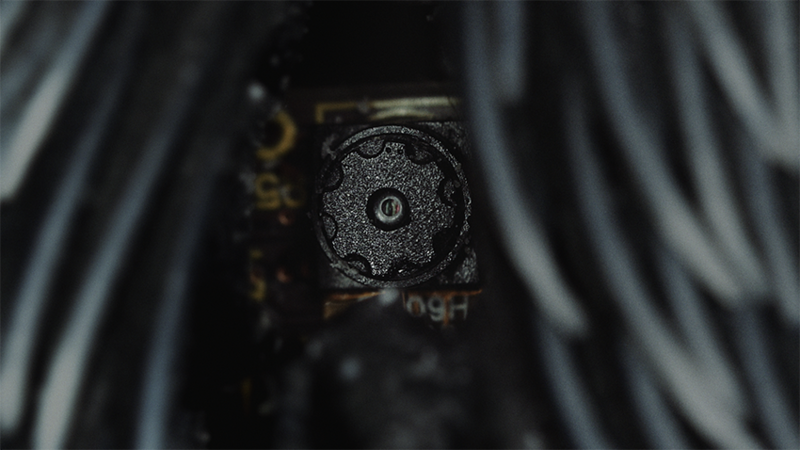 Small tracking camera, with lens smaller than 3mm, embedded underneath the quills. Image courtesy of Behnaz Farahi. Caress the Gaze addresses the emerging field of shape changing structures and interactive systems that bridges the worlds of fashion, art, technology and design. The project is an attempt to couple our biological body with a nonorganic garment as an extension of our skin. It does so in the belief that by implementing design and motion principles inspired by natural systems, we might be able to rethink the relationship between our bodies and the surrounding environment. 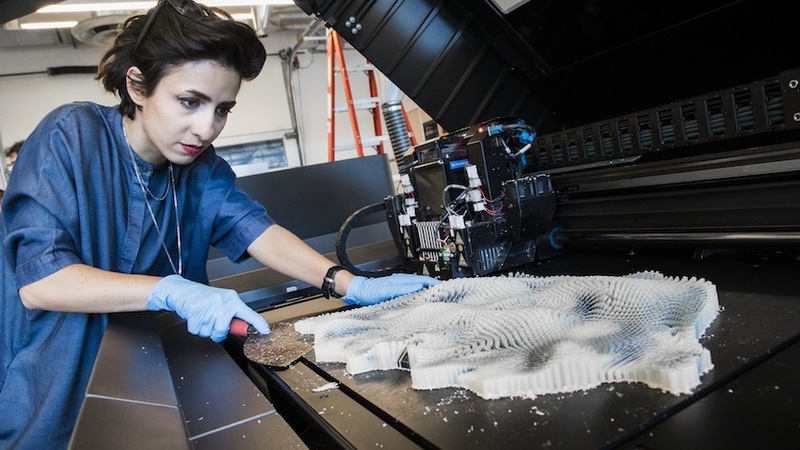 Traditional, static, single-state 3D printing has given way to printing technologies employing a range of different materials, which can provide new opportunities for physical shape changing through the distribution of those materials. 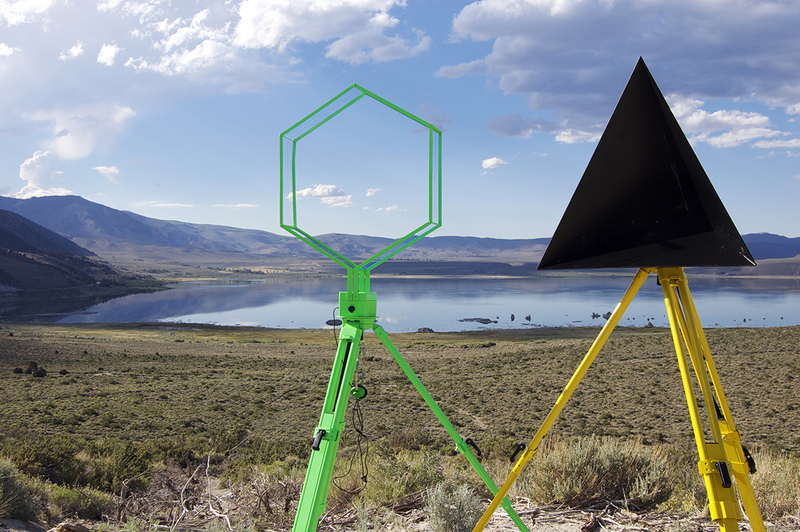 The project demonstrates the novel ways of interacting with our environment. Just as our skin can respond to various internal and external stimuli, so too can our outfits. Even though the approach is speculative, Caress the Gaze opens up the possibility of a radical new approach to interactive clothing—one that moves beyond environmental stimuli and responds to various social issues such as intimacy, privacy, gender and identity. Caress of the Gaze from Pier 9 on Vimeo. Video courtey of Behnaz Farahi. Caress of the Gaze was developed in San Francisco as part of the Artist Residency at Autodesk Pier9, and was also sponsored by the MADWORKSHOP Foundation.